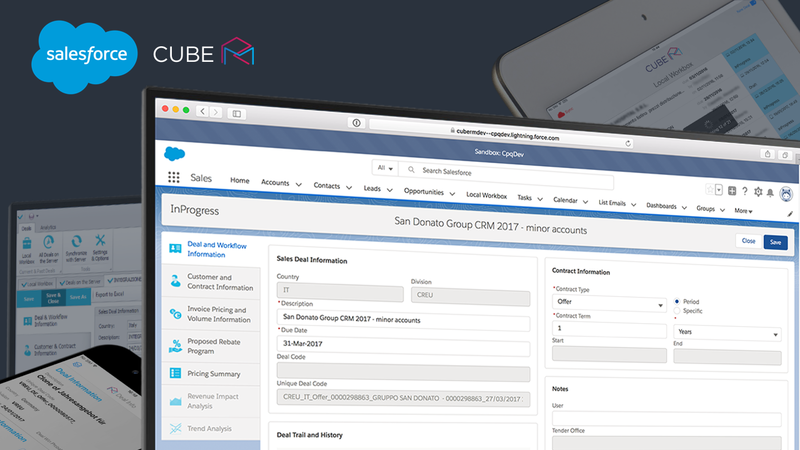 We are excited to announce that Cube RM CPQ (Configure Price Quote) runs now natively on Salesforce.com! Lightning-ready, our new client comes as a great addition to our existing interfaces for the desktop, tablet and smartphone devices. Users can now work seamlessly between devices and operating systems depending on their needs, either from their office or on the go. Porting our software products to the Salesforce.com platform is part of a long-term strategy and commitment of our organization to be part of the vivid Salesforce.com ecosystem. The Salesforce.com client of our suite provides users a full Lightning experience and integrates seamlessly with the current implementation and sales processes. As part of the CRM workflow, it complements the sales opportunities system within Salesforce.com, facilitating sales proposals management and approvals, while offering guidance and recommendations on best pricing to win the sales deals by analyzing past sales and competitive data based on our Machine-Learning Predictive Intelligence. Our CPQ is part of our broader Revenue Management & Optimization suite that helps large companies across industries that are challenged every year with hundreds of millions due to revenue leakage and hundreds of thousands of productive sales hours due to inefficiencies related to revenue management processes. Identifying the optimal price per customer and efficiently managing the sales process, including Quotation, Tenders, and Contract Compliance, are core parts of these challenges and key elements of the Cube RM Revenue Management & Optimization solution. Our software suite complements CRM and ERP systems and unifies strategic and executional pricing processes helping enterprises to increase revenue performance and process efficiency using cloud technologies, enhanced UX, and machine-learning. Immediately after porting the CPQ to Salesforce.com, our Tender Central software for tender management and evaluation will also follow. Next generation revenue management software helping large enterprises to easily manage, evaluate, and optimize tenders & sales quotes leveraging machine-learning, applied economics, and competitive intelligence.